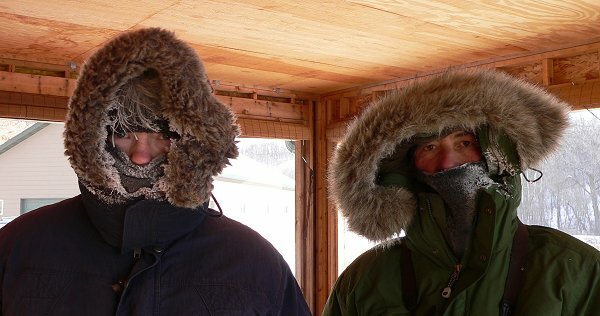 It’s been very cold in the last week – it was 26.7 degrees below zero this morning. Yesterday’s high was 5.6 below zero. Not good weather for being outside for long. We bundle up and take our morning and afternoon walks, but it’s too cold to work outside. It’s interesting to watch the two weather stations. The one in the valley gets colder at night – it recorded 26.7 below zero last night, and the one on top only recorded 18.7 below. And the valley thermometer also gets warmer during the day – 5.6 below zero was the high in the valley, and 6.3 below zero was the high yesterday on top of the hill. I like being able to check the temperature and wind speed from the house – it was definitely too cold and too windy to do any seeding. The wind speed was only between 4 and 10 mph, but with the temperature the wind chills were in the minus 20s. Patty and Martha came to visit overnight. 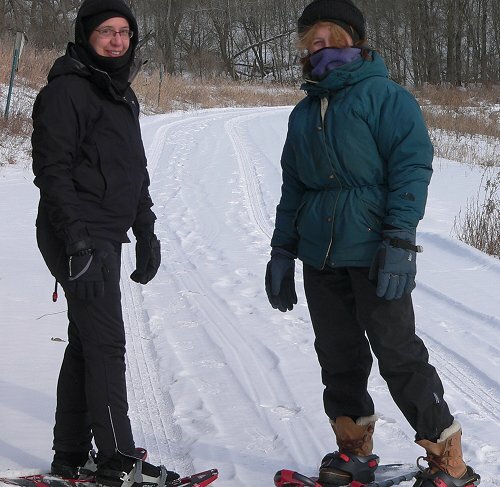 They got to do two walks – well bundled up – on snowshoes. We only have 6 or 8 inches of snow, but it’s still much easier to walk with snowshoes than to try wading through the snow. 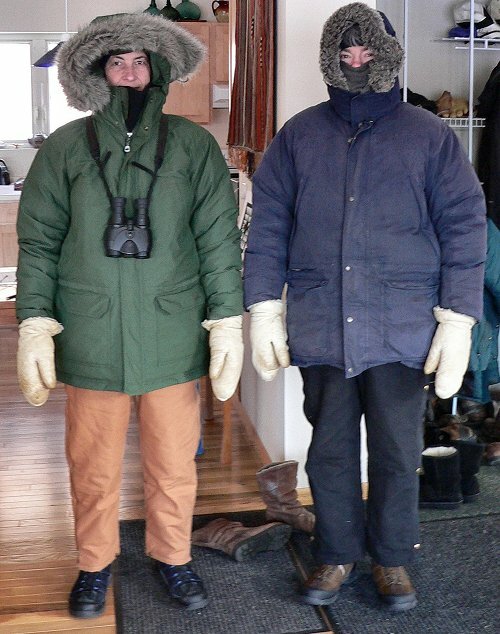 Here are Patty and Martha setting out for a trek up the hill. I haven’t been seeing many raptors – I wonder if they don’t fly as much when it’s this cold. There are still plenty of birds at the feeders – at times there are more than 100 goldfinches scrabbling in the sunflower seeds, and vying for turns at the thistle feeders. The beaver lake is completely frozen over. The creek is still running into it and out the other end, but the still water behind the dam is all frozen. There are plenty of animal footprints in the snow. We were hoping we had reduced the deer population this year, but now that hunting season has been over for a while they’re all coming back. We don’t see them as often as we did earlier in the year, but we see lots of footprints. We see coyote prints too, and one day last week we watched a coyote wander across the prairie and into the woods at the edge of Center Valley. We’ve been trying to figure out if we could hire some folks to help us clear the brush and small trees on our savanna points, so last week I walked around taking photos and counting trees. 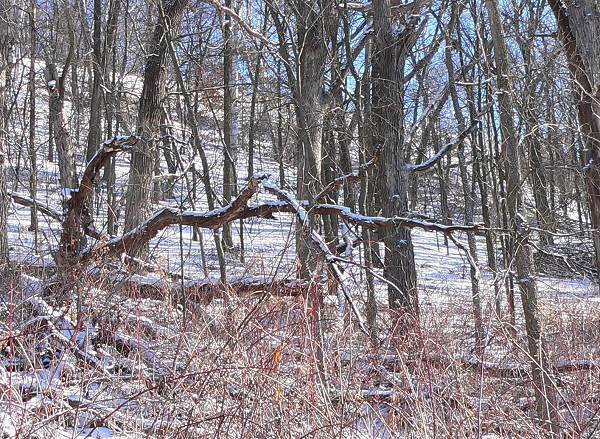 This is the woods below Big View Prairie that should be savanna. The larger trees are White and Burr Oaks, with a few big, old Black Cherries. 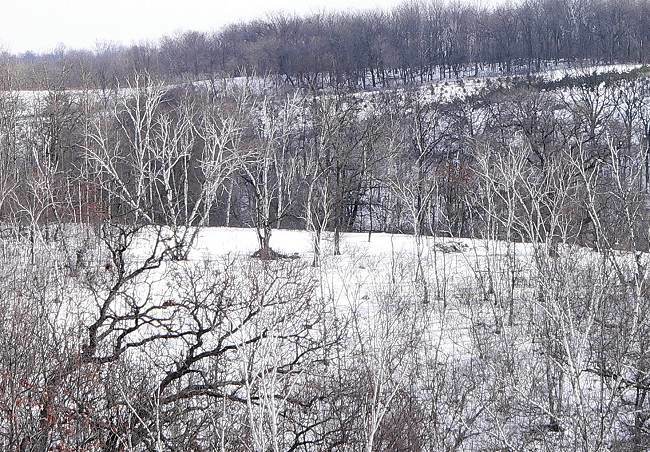 The smaller trees are mostly Elm and Box Elder, with White Birches at the back, at the bottom edge of the prairie. We’re hoping that if we cut out all the smaller trees and the birches, the savanna vegetation would have a chance to recover and the hillside would look more like the way it did 150 years ago. Below the woods is the area where we had the pine plantation logged a few years ago. Black Cherry, Raspberries, and Honeysuckle have grown up between the stumps, and it’s difficult to even walk through it. Here are a couple views of that area. I think if we had a couple people cutting and piling the brush, I could walk along behind them treating the cut stumps. 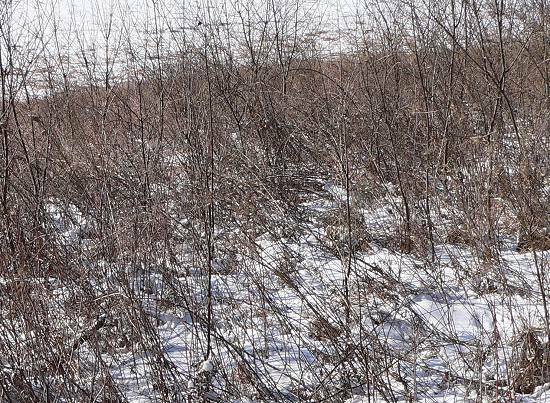 Then we would be able to plant prairie seeds in that area. We have great hopes that someday all our points will be savannas, and all the fields will be prairies. It’s easier to see new views in the winter, when there are no leaves on the trees. 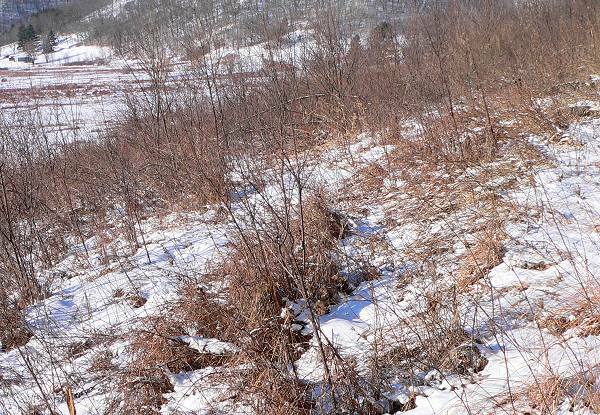 This is a view of Indian Grass Prairie looking across from Western Prairie – we cleared the top of the ridge last fall and it’s fun to see it from a new angle. The hill beyond Indian Grass Point belongs to our neighbor. He’s planted a forest of little pine trees.